Four 19 year olds make up The Music, one of the most ridiculous band names in history, only because they thought of it just now, before anyone else. They are a band that people are passionate about and I haven't a clue why. 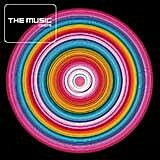 Their debut album, entitled, The Music (another display of sheer genius), is the strangest album released this year. It's strange because it is such a step away from the current state of music, yet it's not any good. The influences are hard to miss: Led Zeppelin, Verve, The Stone Roses, and what shouldn't but obviously is, a definite trace of Blind Melon. The lyrics are pitiable, especially on the former single "The People", which repeats the title more than anyone could possibly want. What is an even bigger shame is that there are moments of brilliance here. The production sounds so far away, and for a band to actually pull that off on a major debut, it's definitely admirable. Tracks like "The Dance", which is vigorous enough to make anyone nod their head and "Take The Long Road And Walk It", which contains one of the best riffs to begin a track this year, stand out as honourable moments of musical intelligence. Yet, once you begin to think it isn't as bad as you initially thought, the 80s metal-balladry of "Turn Out The Light" attacks the senses, forcing any bit of sympathy or respect for them right out the window. The Music isn't worthy of such a name, and the success they are having it mind- baffling, but there clearly is something here for them to work with. If they can somehow abandon everything that inspired them and regroup with fresh ideas, maybe they will have something to praise. C+. Music For Our Mother Ocean II: A Benefit for the Surfrider Foundation Mustard Plug: Evildoers Beware!